456Sailing is a WooCommerce theme, built on Bootstrap grid system for eCommerce, corporate websites. Theme is fully translation ready, compatible with WPML Multilingual CMS plugin. 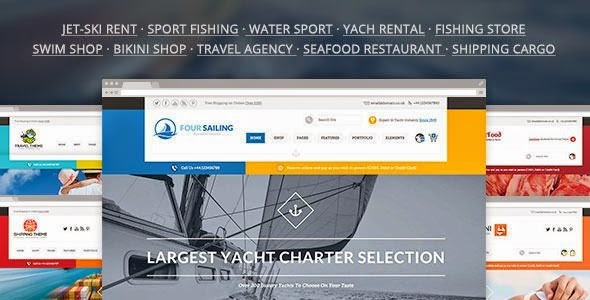 It has beautifully design template for Jet ski rent website, Sport fishing website, Water sports website, Yach rental website, Fishing store website, swim shop website, bikini store website, Travel agency website, Seafood restaurant website and Shipping Cargo website templates. Item Reviewed: Multipurpose eCommerce and Corporate WordPress Theme 2015 9 out of 10 based on 10 ratings. 9 user reviews.